Simply store your favorite pictures, music and video collection on the Cruzer® Fit™ USB flash drive and start sharing with your family and friends. 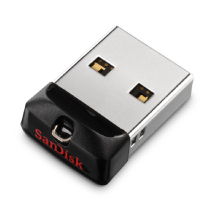 Plus, you can also keep your private data private, with the included SanDisk® SecureAccess™ software††. Whether it's your favorite music or your most important work documents, the Cruzer® Fit™ USB flash drive gives you the storage you need in a compact and portable device.